We've Never Stopped Thinking About Kurt Cobain : The Record Twenty years after his death, Nirvana's music — and tributes to and fights over it — remains a steady presence. Here's a taste. 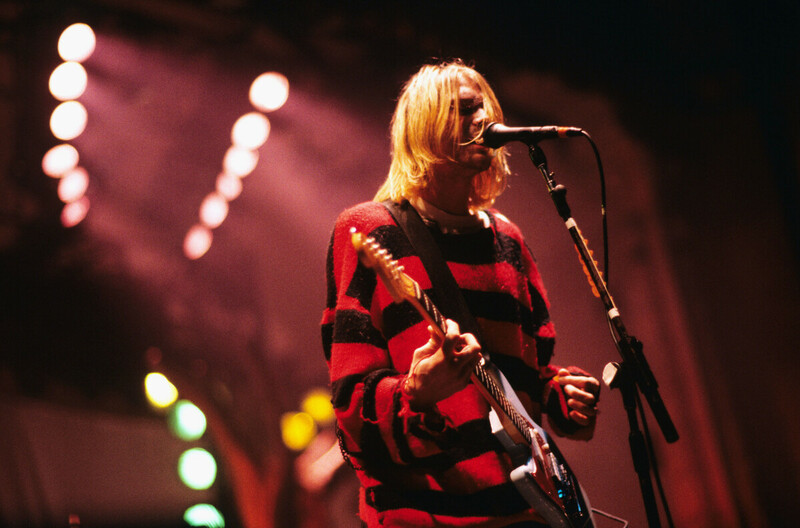 Kurt Cobain performs with Nirvana in 1993. Kurt Cobain died 20 years ago today. It's hardly news. You've probably already seen plenty of tributes to his career and what might have been, along with, perhaps, a criticism of the impulse to memorialize his death simply because it's been a round number of years since the event. We tend to agree with that line of thinking, mostly because Nirvana has never gone away, not for a day of those 20 years. "Smells Like Teen Spirit" is as old today as "Let It Be" was when Nirvana made its era-defining song. I hear "All Apologies" nearly every time I put the radio on scan. Nirvana is classic rock — not so much in our rear view mirror as comfortingly, reassuringly present (which, for those of us old enough to remember the band, is its own weird thing). It's natural to want to spend time with musicians you love after they're gone. But instead of re-assessing Cobain's legacy, we're going to acknowledge here that we've never really stopped looking back. We've thought, and written, and said plenty about him in the last 20 years. Here's a taste. In 2011, the producer who helped the grunge trio break onto the pop charts spoke with Morning Edition's David Greene. For the 20th anniversary of the Nirvana's final studio album, Cobain's band mates spoke with All Songs Considered's Bob Boilen and Robin Hilton about the making of In Utero. 17 years after he appeared as the baby on the cover of Nevermind, Spencer Elden spoke to NPR's Chana Joffe-Walt about his still public image. In 2000, NPR's Guy Raz looked at how Cobain put together the pieces of 'Smells Like Teen Spirit,' and then how it became an unlikely smash hit. NPR Music's Stephen Thompson explains his personal history with Nirvana's most famous song. 10 years ago, Nirvana fans spoke with NPR's Luke Burbank about why it didn't seem like 10 years had passed since Cobain's death. In 2011, NPR's Marcie Sillman spoke with Seattle residents about how Cobain's shadow still loomed over the city.